So David has become Saul's armor bearer and plays anointed music to minister to the troubled king. Yet occasionally he goes back to tend his father’s flocks. Those are the times that David is refreshed in the Lord and spends intimate time with Him again. Then comes the moment that changes David’s life again! God has prepared him for this day that he slays a giant called Goliath. He has already faced a lion and a bear, while watching his father’s flocks, and has come out victorious. His trust is in God, not in his own ability. He is told by his father to take toasted grains, cheese (the original nacho chips), and bread to his brothers who were serving in King Saul’s army. They have been camped on a mountain facing the Philistine army who was camped on a mountain facing them with a valley between them. For forty days, each morning and each evening, Goliath had been taunting the Israelites (and especially King Saul- who stood a head taller that all the other men of Israel) crying out to them to send out a warrior to fight. Goliath was a giant of a man, an intimidating dude standing about 9 feet 9 inches tall (six cubits and a span), his spearhead alone weighed the same as a bowling ball. and he walked around wearing about 150-200 lbs of armor. He even had a servant whose job was to carry his shield for him! David arrives on the scene at the moment the armies are going out to the fight and to shout for the battle. The fearful men of Israel ask David (remember, he is Saul’s armor bearer) if he had seen this man, and if he knew about the reward Saul offered anyone who would take Goliath on in battle. David turns and asks about the reward just as his oldest brother Eliab comes up and overhears the conversation. He gets angry, starts to rail on David and tries to belittle him, accusing him of pride and insolence. David does not argue or lose his focus (or temper), but he deflects the accusation with a question. He turns to someone else (ignoring his brothers words) and again asks about the rewards. David then finds more opposition when he goes to Saul and tells him not to fear, he would take care of this uncovenanted man defying the armies of the Living God! Saul tells him he is not ready; he is just a boy, and the challenger has been fighting since he was David’s age. He even tries to put his own armor on David. David again defies discouragement as he rehearses the victories he has had in his life and ignores the words of unbelief! He prophesies and speaks out in faith what will happen to the giant. He then goes and collects 5 smooth stones. He doesn't pick so many stones for fear, but for anyone else who would challenge or defy the Lord. As David comes near, even Goliath tries to belittle him and to tell him what he was going to do to David. His response was to let the giant know that he was not just facing a boy with a sling, he was facing a man who came in the name of the Lord of Hosts; the God of the armies of Israel, whom he had defied! David warned him who he was up against. David knew who he was, and more importantly, Whose he was. He ran toward the giant; put a stone in the sling, and bam! The giant fell face-down with a stone stuck in his forehead. David then takes the giant’s own sword and cuts off his head! There are a few lessons from this chapter in David’s life that I want to share. David knew who he was, but was not full of himself. He worked closely with the king, but was humble enough to go back and serve his father in the sheep pastures. As believers in Jesus, we also should know the authority and anointing that we carry; Hey! We are family of the King! However, we should never allow that to cause us to be puffed up or arrogant, and we should ever be humble to serve wherever we are needed. David faced opposition from three main places; two of which he probably didn’t expect. When he was opposed by his oldest brother, Eliab, he did not allow his words to discourage or anger him. It could have been easy for him to shrink back at his words and hide. Eliab was his big brother, he was the one that Samuel wanted to anoint, and would have anointed if God had not told him, “No.” He could have just gone back home and no one would have faulted him. On the other hand, he could have gotten angry and bitter, or even started a fight with Eliab. He could have acted out in the flesh and boasted that it was he that was anointed by Samuel, not Eliab. He could have accused Eliab of jealousy, and told him that he was the proud one. He could have… but he didn’t. How many times have we faced opposition and shrunk back? Or have we become angered? David’s strategy was very similar to Jesus’ strategy at times when he was accused by the Sanhedrin. He ignored them, but would then ask them a question. David did the same when he asked, “What have I done now? Is there not a cause?” 1 Samuel 17:29 He then goes on like Eliab didn’t bother him. The next opposition David faces is when Saul tells him he is not able to go against Goliath. He is a mere lad, not a warrior. Saul is convinced by David’s words, but then tries to get him to conform to his way of battle by giving him his armor. If David would have trusted Saul’s armor, it would have been disastrous. David was not made to wear Saul’s armor, it did not fit. The third opposition David faced was the enemy himself. 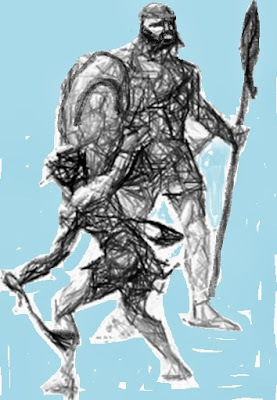 Goliath would have been an intimidating foe, after all, he had been making a challenge for 40 days and not one warrior would accept the challenge. Not even Saul, who by rights should have. After all, as king of Israel, he had been anointed as the leader of Israel. It was his responsibility and God could have done the same for him as He did for David… but Saul was afraid. Goliath disdained and despised David. He cursed at him, and swore all types of hurt that he planned to give to him. David speaks faith-filled words to the enemy; he speaks out what he believes will happen because of the One who he serves. He speaks out what the Lord is going to do and how he will use a shepherd boy to do it! We stand in the grace of the Lord Jesus Christ who conquered death, hell, and the grave. He is our champion, and because of His victory, we need not fear. Even when the opposition comes from people we love and trust we need not shrink back or become angry. We answer wisely, and often times, the wisest answer is another question or nothing at all. Then speak faith-filled words of what you believe the Lord is going to do and watch how God does it!